SHARE Celebrate the gathering of your friends and family by toasting to them and each other with a set of Wedding Bells Toasting Flutes. This dazzling design will be the highlight of your head table. 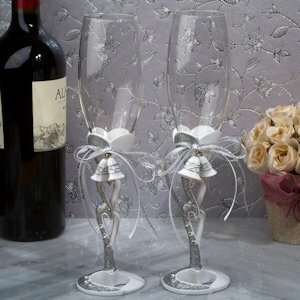 Each set of 2 flutes are made of a resin base accented with a pair of hanging wedding bells highlighted with a sculpted pair of hearts in a shimmering silver glitter finish attached to glass flutes. We package them in a lovely display box for years of enjoyment. Flutes measure approximately 10" high.